Become the strongest duck warrior in Duck Life Battle Game. Take control of a little duck as he train and do battle with other ducks. Train your duck’s power, health, defense, speed, and special attack abilities. Explore the world to collect coins, going on quest, and entering tournaments. The ducks that we know so well from the previous Duck Life games are back, but this time they’re angrier. Forget racing, now it’s time to battle! Prepare your ducks for battle by training them. Once you are ready, head to the battlefield and start fighting other ducks. Don’t forget to buy equipment to help you. So enjoy and have fun in playing Duck Life Battle Game. 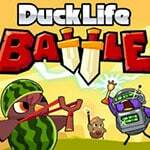 Duck Life Battle Game is one of our Action Games at Round Games. It is also tagged as a battle game. To play even more free games, view our most played and all games pages. If you want to play more games like this game: Then you can simply check out the games inside the game tags that are the most relevant to your interests or check the Action Games category or check the related games section at the end of the game page.